Grosse Ile, MI Saxophone Lessons Near Me | Fun Classes. Top Teachers. Check out some of our most popular teachers near Grosse Ile, MI including Troy, Sterling Heights, Detroit, Bloomfield Hills and Royal Oak. Students start with the Rubank book for Saxophone. Later we will add the Universal Sax method and move all the way up to Ferling Studies, along the way we learn to sight read and our scales. We work on both classical Sax solos and on jazz, learning to improv. I have been teaching music for over 20 years and playing as a professional musician for even longer. I know how to get the best out of my students and have fun doing it. I'm a University of South Florida grad and I have worked and studies in Las Vegas and at the Berklee school of music. My students constantly win superiors at contest and sit in the upper chairs in band and orchestra. Lets have some fun and make some music. In a laid back fun way we will learn the fundamentals of our instrument. I start out with the All For Strings series of books and add the Suzuki method books for some tunes. In 3 to 6 months you will be playing the music you like and having fun and learning new things while you do. Very patient and teaches on a level that my child can understand. Great teacher! Highly recommend. Teaches the fundamentals while incorporating fun musical facts along the way. I've been playing saxophone for 15 years, and I've picked up some cool tricks along the way! 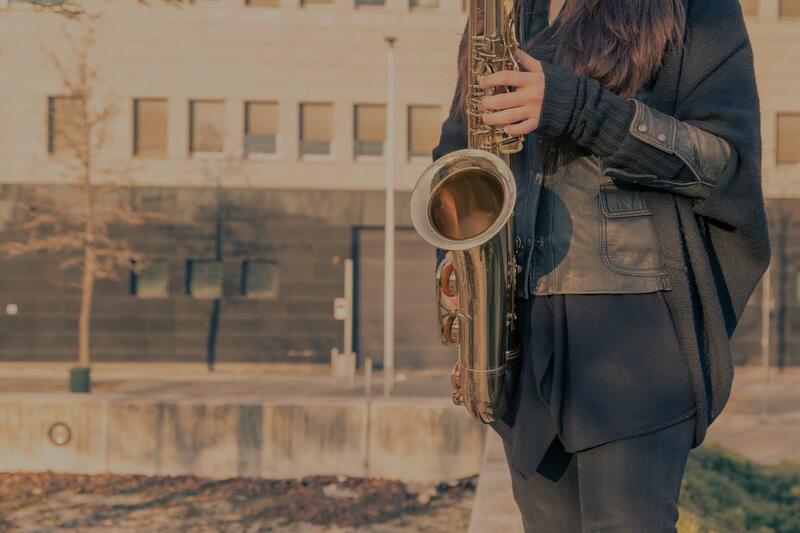 Saxophone lessons are custom tailored to the student's individual skill level. Beginners learn basic technique and a foundation of good habits to build on! Intermediate players challenge themselves with more difficult pieces, requiring use of more refined techniques. Advanced players prepare and perform advanced pieces, and work on the most advanced techniques. I'm a pro saxophonist in NYC, currently performing both in the NYC area and internationally. In the last 5 years, I have been performing with various bands in the area, spanning rock, funk, soul, Latin, and especially jazz. Performing has taken me to France, Switzerland, Italy, China, and most recently aboard luxury cruise ships. I have been teaching privately and through a private music school for the past 10 years. I offer three distinct types of lessons. ults. 2) My more expansive lessons are for beginner musicians and up. We work as basically as scales, modes, and fingerings, as well as a little bit of jazz history. As you progress, we dig deeper into jazz theory, focusing on the standards and improvisational theory. Like anything else, you get out of it what you put into it, and as long as you are willing to work towards becoming a better player, you will. 3) For NON-SAXOPHONE students with an interest in jazz improvisational techniques, I offer jazz improvisation lessons. This requires an intermediate level of proficiency on your instrument. We cover standards, different techniques to apply over different patterns of chord changes, and even basic elements of composition. I like to keep the atmosphere light and positive during lessons, so we can have a good time and still be learning. I love to work on appropriate music that the student suggests, or has an interest in. Pending the level of the student, we may even arrange for special appearances at some of my performances. Looking forward to making some music with you! When I asked my son how his lesson went he said “I struck gold”. Imraan is amazing! An excellent teacher. He keeps my son Sal interested and engaged with every lesson. Sal gets to choose some of the music he works on, and Imraan makes it into a lesson. Sal has been doing much better in band class, I recommend him! My son Nicholas, 10 yrs old, has been taking saxophone lessons with Imraan for about a month. Searching for a young motivated teacher who is up to date with todays music is very difficult. My fear was for Nicholas to get discouraged in his saxophone playing and music with a non motivated instructor. Imraan has been the perfect match for Nick. He is not only an excellent saxophone player but a great instructor. He motivates my son with his saxophone playing, has patients with his teachings and with kids, is up to date with todays music and most important, my son cant wait for his next lesson. Imraan, Im glad we met you and look forward to hearing my son play in concert with you someday. I teach beginner through year 5 saxophone students. Teaching online since 2013. Teaching online since 2013. I teach beginner to advance flute and beginner to intermediate clarinet, saxophone, trumpet, trombone, euphonium, and tuba. I believe that performance-based music programs offer the most effective way to prepare 21st century students for the challenges of today’s competitive environment. My lessons are designed with the 21st century learner in mind. I am passionate about providing the best music education possible to all of my students. My goal is that every student develops and is able to share the same love for music that I enjoy. Karyn is a wonderful teacher! I was having trouble finding a private flute instructor in our area and, to my surprise, found that one could take lessons online. It's working out very, very well. Karyn's experience in music education is obvious and translates easily, even though lessons are online. She relates well to my fifth grade daughter and pushes her to do her best. I appreciate her patience, her encouragement for a job well done, and her guidance as to how to do better. This very choosy mom would recommend Karyn in a heartbeat for your flutist. Extensive music theory application and rhythm concept. Hi! I have a Bachelors in Music Education and have experience teaching many beginning students! I have 3 children and decided to give up regular teaching to be with them. I believe that tone production is the most important area of study. It doesn’t matter what you can play if it doesn’t sound good. I can’t wait to help more students love to “play” on their instruments! o continue giving lessons. I have the most experience with Flute, but can teach many other instruments: flute, clarinet, saxophone, trumpet, trombone, baritone/euphonium, piano. I have worked with many different age groups and levels of ability. I am happy to help you learn to have fun and "play" your instrument! Mrs. Bemus provides a calm nurturing approach to teaching. She saw potential in me, and helped inspire me to become a future educator myself. Kim completed her student teaching in Music Education at Roosevelt High School in Wyandotte. During her teaching she worked with all instruments Flute, Clarinet, Sax, Trumpet, Baritone, Trombone, Tuba and Percussion. She also assisted with the award winning Wyandotte Marching Chiefs Marching Band Program. Kim is a fantastic instructor! She is experienced, encouraging, and patient with students as they are learning. She helped me prepare for solo and ensemble, and supported me throughout the process. I highly recommend choosing Kim as your instructor. I am Belmont University School of Music Graduate that can teach all styles and teach all saxophones (soprano, alto, tenor, bari) I have taught young students and adults up to age 70! I love teaching and try to make it fun for the student. I am a Belmont University School of Music Graduate that plays all the saxophones, clarinets, and flutes. I love what I do and try to make the students have fun while learning as much as possible. I have lived in Nashville TN for five years and love it here. I have taught since sophomore year of high school and love working with students. Max is an awesome teacher! He is very knowledgeable and patient which was exactly what my son needed. He was also very accommodating and accessible for times when we needed to reschedule. My son’s performance increased dramatically only after one summer of weekly lessons. Can’t say enough good things about Max. Really knows the instrument, knows what to hone in on for improvement. Very personable. I love passing on what I've learned while I've been at school! While I might be young, I have taken lessons with the great jazz saxophonist and arranger Charles "Chip" McNeill and the world renowned classical saxophone teacher and performer Debra Richtmeyer so I hope to pass down the love of the instrument that they've instilled in me. I'll cover the basics of the saxophone, as well as clarinet and flute if interested, and some great exercises and methods that my teachers have me do in order to improve. But in the end, I'll let the student decide what they want to learn. I'm open to many music styles and will try to lead each student in the right direction. My name is Adam Nigh and I am currently a junior studying jazz saxophone at the University of Illinois Urbana Champaign. While I might be young, I do have teaching experience with middle school band. I hope to pass on what I've learned from my teachers, Charles McNeill and Debra Richtmeyer, two world renowned professionals. My main instrument is saxophone, however, I do double on both clarinet and flute and have a background in piano as well! I would love to teach any beginner or intermediate level students over the summer and grow along with you musically! Can't find a teacher in Grosse Ile, MI? he saxophone. Working with her really helped me not only musically, but also confidence wise. Kim Bemus is not only super encouraging but will work with you at whatever speed you need to go in order to get better. If it wasn’t for her mentoring and patience, I would’ve never continued playing the saxophone or became the musician I am today. If I had to suggest someone to do tutoring with on saxophone - or any instrument, I should say - I would suggest her in a heartbeat." Detroit, MI teacher: Kim B.
y son, who is 12, stated that Mr Miller was cool and spoke his language so that he could understand." Detroit, MI teacher: Benjamin M.
ng more lessons with Ben." even the finger type. My son is so happy to learn with him. And get repaid improvement even he is zero experience to start. Now my son is loving saxophone. And I am so happy we can have Ben as his teacher." "Benjamin is a great teacher, great observer and wonderful company in online teaching. I couldn't ask for more." "Mrs. Bemus provides a calm nurturing approach to teaching. She saw potential in me, and helped inspire me to become a future educator myself." e concepts progressively and in as congenial a manner as possible. I highly recommend Ben for all new and experienced students alike. Ben has skill(s) in good measure coupled with his understanding of a student's comprehension level. When you sit and learn with Ben, you just wish that the class carries on without a break. His enthusiasm is so contagious!" "Very informative for my son." "Very friendly, professional, timely, and all around nice person, worked with my 15yo son 10 lessons baritone sax !"